There were 28 of us, all squeezed in a UAZ-452, an extremely tiny mini-van from Soviet times. We were sitting one in front of the other and the seats were so narrow that our legs were crossed over, to the extent that, occasionally, my knees were touching the belly of the man in front of me. When it seemed that there was no more physical space, the UAZ stopped to pick up a few more people, who had to half stand with their cheeks stuck to the window. 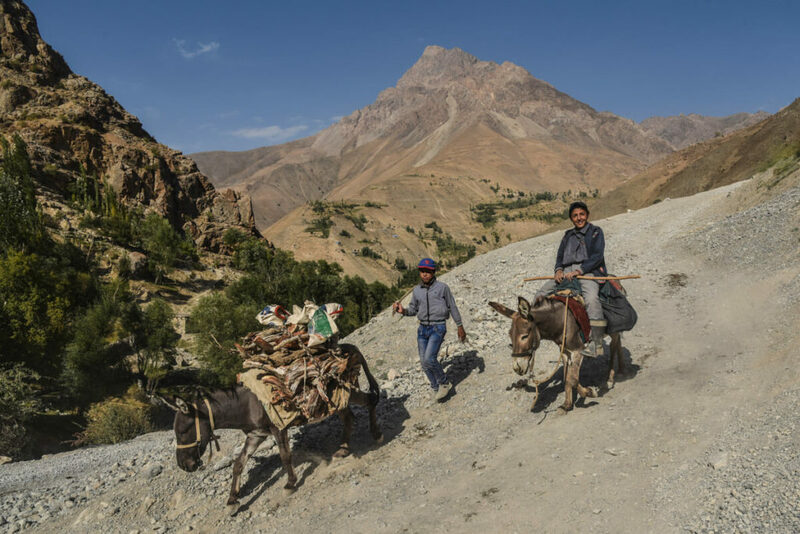 We were driving towards the Fann Mountains of Tajikistan, in the western part of the country; a remote mountain system of extreme beauty and home to tens of small villages inhabited by locals, who will always bless you with great hospitality and generosity. 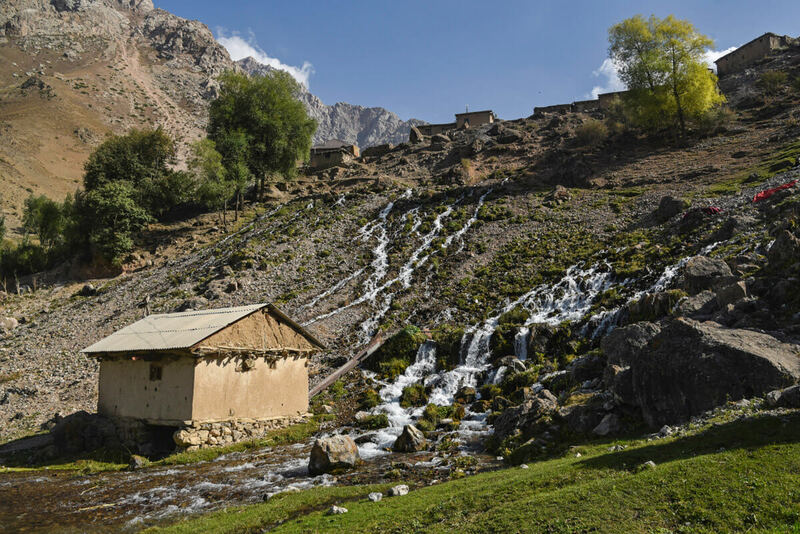 Trekking the Fann Mountains is the perfect journey for those seeking to combine real adventure with authentic local culture. 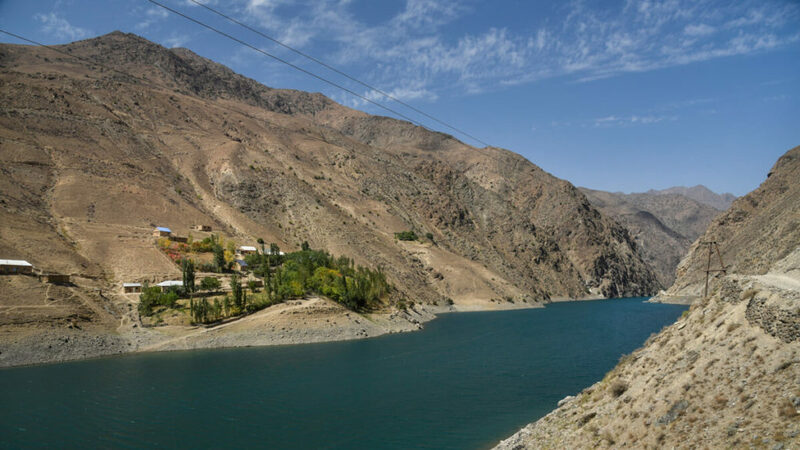 Tajikistan is a mountainous country, where you find most of the Pamir range, the third highest mountain range on Earth, after the Himalayas and the Karakoram. 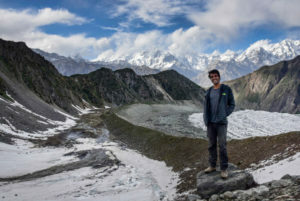 After hitchhiking the Pamir Highway and wandering around the mystical Wakhan Valley while skimming Afghanistan, following a ten-day break in Dushanbe, we decided to go and explore the Fann Mountains. The Fann Mountains are a group of mountains located in west Tajikistan, bordering Uzbekistan. 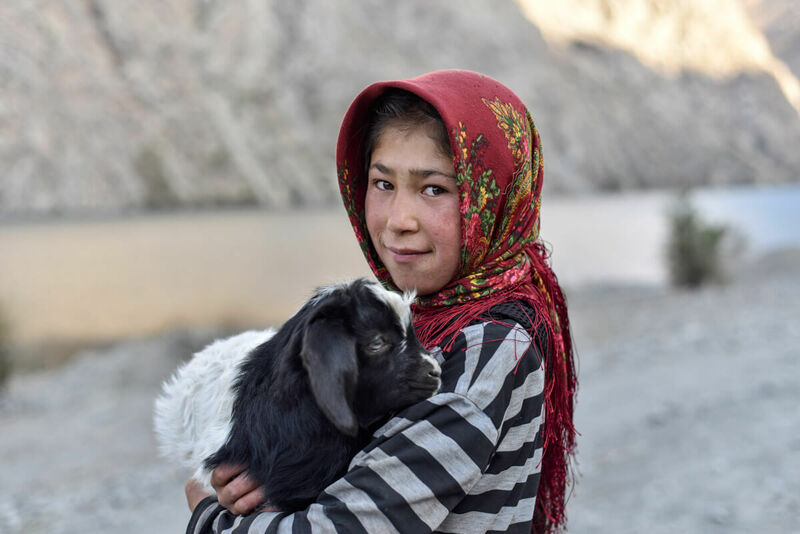 They belong to the Pamir-Alay, a mountain system spread across Kyrgyzstan, Uzbekistan, and Tajikistan which, at the same time, also belongs to the great Pamir range. The Fann mountains are composed of around 100 peaks, the highest one being Chimtarga, at 5,489 meters. 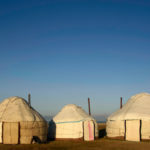 Unlike the eastern Pamirs, the Fann are highly accessible. 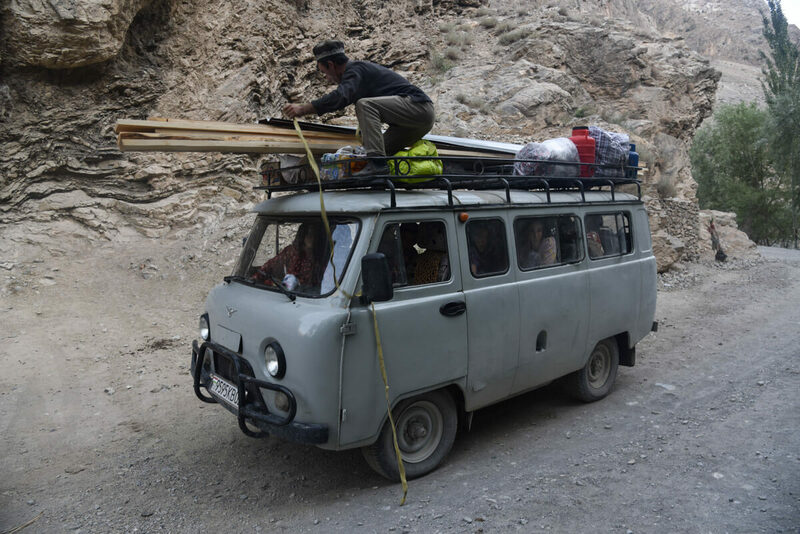 However, they tend to be overlooked by most travelers, as the Pamir Highway and the Wakhan Valley are on everyone’s priority list if you don’t have a lot of time. 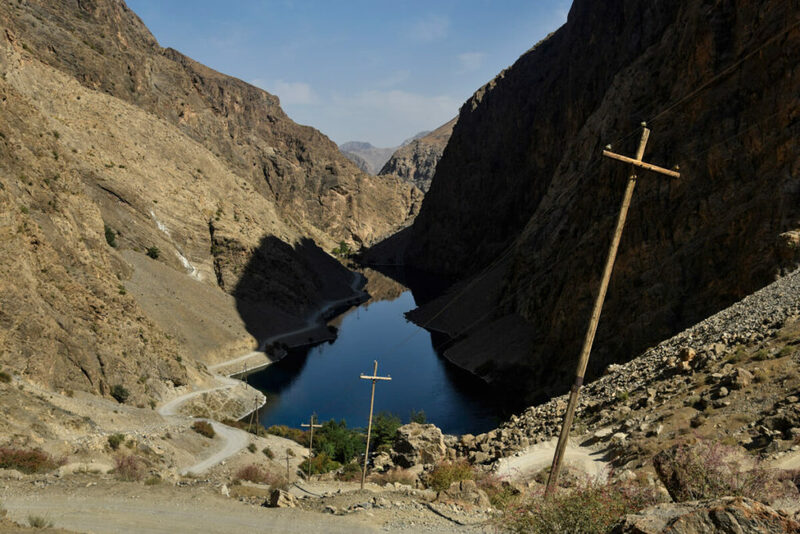 Nevertheless, with countless lakes and small villages, in the Fann mountains, you’ll find very attractive scenery and very different geology and landscape from the eastern part of the country, besides being inhabited by people with a very distinct culture as well. Therefore, if you have the time, I strongly recommend you pay the visit that these Tajik mountains deserve. Like any mountain system or range, the trekking options are interminable. 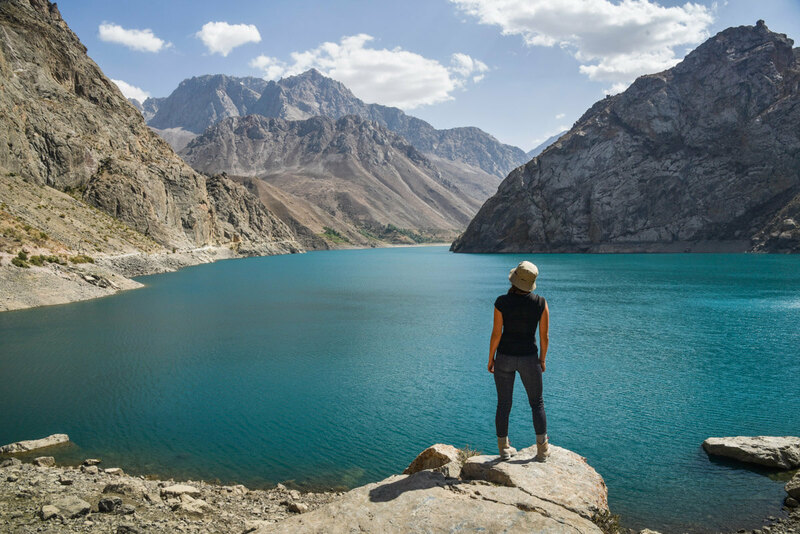 The most famous spot would be Iskanderkul Lake, a huge lake which has been a pretty popular touristic spot since the Soviet Union. Without any doubt, this is a nice place but, actually, it has also become very touristic at a local level, so if you are looking for something more adventurous and want to meet authentic Fann Mountains people, I suggest you trek to the 7 lakes, a 2-3-day trek through seven dreamy lakes and many small villages filled with very hospitable Tajiks. The trek to the 7 lakes can be done in 2 or 3 days, doesn’t require any tough mountaineering experience and most of the trail follows a narrow road, occasionally used by cars. The trek starts in a small village called Rachnapollon, which is a few kilometers further down from a bigger village called Shing, which is shown on the map. The truth is that neither of these villages is considered the official starting point but they are the last relatively big villages and are less than one hour’s walk from the first lake. From Rachnapollon to the seventh lake takes around 7 or 8 hours, with generous breaks included. The landscape is quite dry and rocky, and you will see that the ground is not suitable for camping. The only cool place to camp is the shore of the seventh lake, where you will find a comfortable meadow. Like I said before, the trail passes by different lakes and tiny villages. The highest point is on the seventh lake, at 2,400 meters, which is not very high, given the fact that we are trekking in Tajikistan. The trail ascends very gradually, except for a few sections where is quite steep. Nothing very difficult. By the way, you could finish the trek in just two days but getting from Dushanbe to the starting point took us the whole day, as well as on the way back. 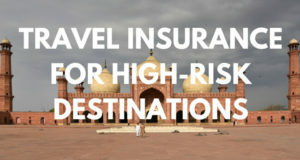 Therefore, save a minimum of 4 days to complete this trip. For me, the best thing about trekking to the 7 lakes was meeting people from this part of Tajikistan, very different from the locals I met in the Pamir Highway, who were mostly Kyrgyz; and the people from the Wakhan Valley, who were basically Wakhi. 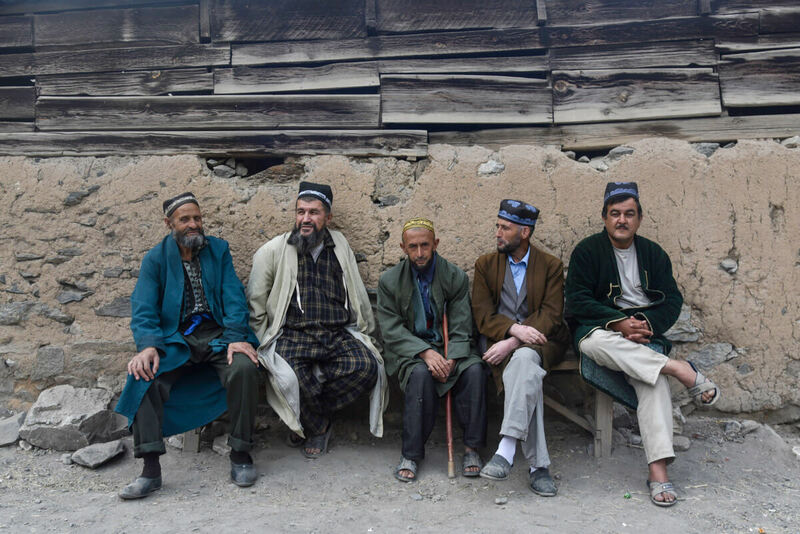 The people from the Fann Mountains are real Tajiks, considered among the most conservative people in the country, which is reflected in their rural life and their complete devotion to Islam, something quite unusual in the ex-Soviet Central Asia. I remember all the women running away from us as soon as they saw me and Sam entering their village. In the same way, when we sat to talk to local men, Adriana felt a bit apart, as, unfortunately, they didn’t say hello to her. 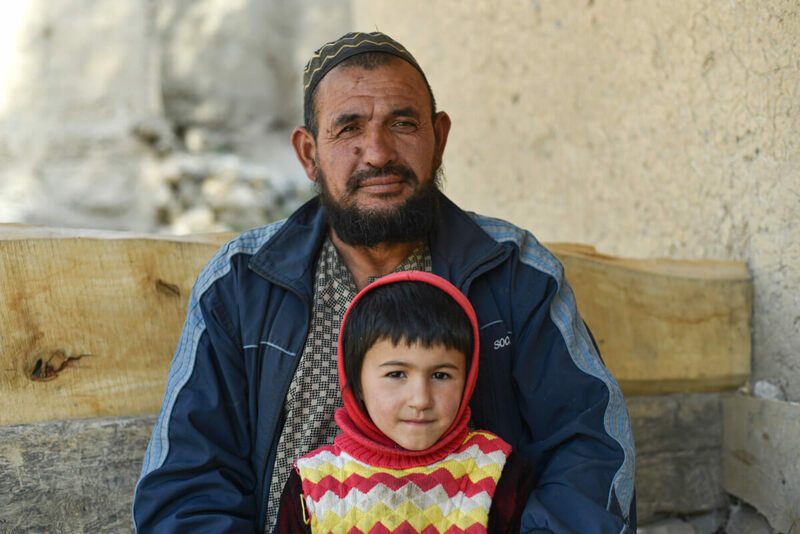 However, those Tajiks are kind-hearted and hospitable and, on many occasions, they offered us tea, food, firewood and even a place to stay. Getting to the starting point in Shing and Rachnapollon is very simple. If you have your own vehicle, from Dushanbe, you will have to first drive towards Penjakent, the main city in the region. A few kilometers before, in Sujina, you will need to turn left, entering the mountains towards Shing. We came by public transport, taking a local shared taxi from Dushanbe to Penjakent, which cost 70TJS (8USD) per person, for a 230-kilometer journey. In Penjakent, for just a few somoni, we got in a UAZ-452, the Soviet mini-van I mentioned in the introduction. It was a really uncomfortable journey, but the experience was worth it. On the way back, we went to Khujand from Padrut, a village located between the fourth and fifth lake. We paid 100TJS (11USD) per person for a local shared taxi. There are no official guesthouses and homestays but we were invited by the UAZ-452 driver himself, who fed and hosted us with an extreme hospitality. On the following day, he didn’t accept our money but, in the end, we agreed to pay him 5USD each, which was not even close to the value of what we had eaten. Padrut is a village situated between the fourth and fifth lake and where you find the only official guest house in the area. It costs 15USD, with dinner and breakfast included. We stayed here on the way back. If you have your own camping equipment, you can camp on the lakeshore without any problem. Travelers who don’t have camping gear can come to this lake on a day trip from Padrut. Backpacker Hostel – Green House Hostel– Comfy beds, a big kitchen and a living room with awesome couches. 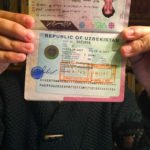 Budget Guest House – Hello Dushanbe – It has both private rooms and a dorm. 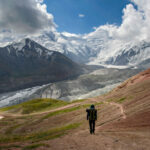 When to go – Trekking in Tajikistan is very seasonal and the Fann Mountains are only accessible from May to October. Buy wine – You will be surprised to know that Penjakent, the main town in the region, is an important wine producer. We found some in the only liquor store in town, located in the bazaar and, honestly, it was not that bad for what it cost. The grape used is cabernet. 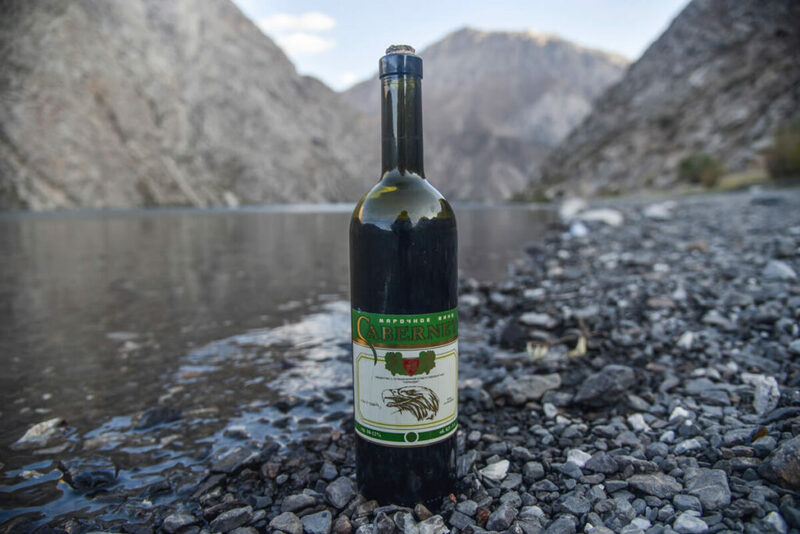 A little wine is always good when trekking in Tajikistan! Firewood for camping – When we camped by the seventh lake, we realized that there were no trees, so we could not collect firewood. However, in the evening, many locals passed by with their donkeys, carrying loads of kilos of firewood. 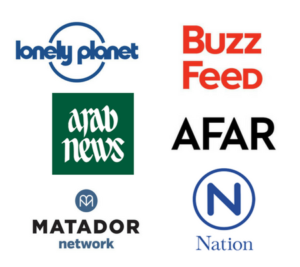 They get it from very far away, from early in the morning. We asked them if they had some spare wood and, very kindly, they offered to us some, so we were able to make a good fire! If you don’t want to freeze at night, do the same! 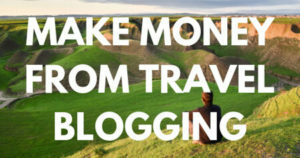 Packing list – If you want to see a complete list of all my trekking gear for Central Asia, check my post about Trekking in Kyrgyzstan, as the trekking conditions are pretty similar and I used the exact same gear. 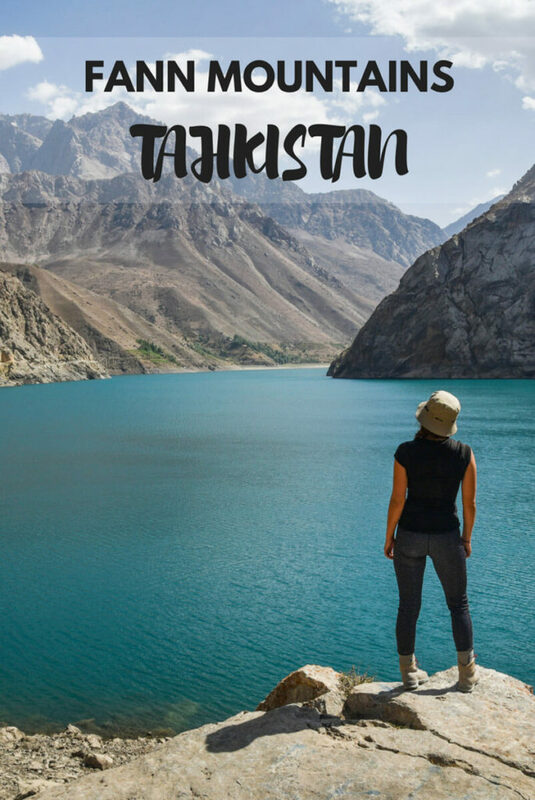 Hi there.. i will be around central asia next year together with a friend of mine and I found your wonderful blog while I was doing my research.. there are few questions I would like to ask regarding to Tajikistan..
1) is there any public shared taxi from Dushanbe to Iskanderkul lake? And another shared taxi from the lake to Panjakent? 2) for transportation from padrut to Khujand, did you guys took the public shared taxi as well? 3) for Wakhan Valley, do you think I can find any public shared taxi from Mugrab to Langar to start off my trip to the Wakhan valley?